Despite having stayed up distilling to the late hours on the previous night, Séamus Holohan opens the door to the Helsinki Distilling Company with enthusiasm. He has agreed to show the place around for BTSB and to shed light on the ins and outs of the first distillery in Helsinki for some hundred years. Located in the ever-so-trendy Teurastamo in Helsinki's Kalasatama, the company started production this past September, despite ongoing renovations at the site. Keeping with the industrial spirit of Teurastamo, the distillery has been set up in the former heating center of the the area - complete with a red-brick chimney that will house the world's first whiskey-powered sauna sometime next year. According to Holohan, the plan is to create a place that promotes understanding over effect, to educate as well as distill and serve alcohol. The beautiful copper still is to be visible from both the entrance and the upstairs bar, complete with a cabinet and a roof terrace, which is scheduled to open next summer, if all goes according to plan. Holohan and long-time friends Kai Kilpinen and Mikko Mykkänen, the partner with a degree in distilling, had been talking about starting a distillery in Finland for ten years, seriously for five, but they nearly had the steam knocked out of their enterprise when suitable locales seemed nowhere to be found. Having checked out places with industrial history and picturesque environments in places like Fiskars and Porvoo, everything seemed either too expensive or very difficult to turn into a working distillery. However, when the trio turned their eye to Helsinki, the situation quickly changed. In 2012, when Helsinki served as the Design Capital of Europe, the former abattoir are of Teurastamo became rejuvenated. Seeing the hustle around first-comers like the restaurant Kellohalli, then run by Antto Melasniemi, inspired the aspiring entrepreneurs to bid for the right to rent one of the buildings from the city of Helsinki. The winning bid, of course, was only the beginning of their project. Holohan is sorry not to be able to offer a taste of their first product, a gin highly praised by both amateur and expert test groups, as Finnish alcohol legislation is not very lenient about the production and serving of alcohol. Holohan calls the regulations draconian, wondering aloud why energy spent on the supposed protection of Finns could not be turned to promoting a healthy moderation when it comes to hard liquor. He quotes education over effect as HDCO's prime directive several times during the visit, hoping for a better appreciation of drinking culture in Finland which would also lead to a better stance to compete with international brands for private entrepreneurs. One of his pet peeves are raw materials. For example, the Finnish malts he praises and HDCO uses for their whiskey are mostly exported to be used by the immense whiskey industry in Scotland. The malts are made into Scottish whiskey that is then imported back to Finland for consumption. To Holohan, there is no reason why Finnish whiskeys couldn't be among the greatest of the world - especially if the industry and the regulators would see the potential and act together accordingly. It's not against the law to sniff at alcoholic beverages and Holohan is happy to say a thing or two about the different products HDCO has in the pipeline while I hold my nose over a small tank of gin. Their first brand is the Helsinki Dry Gin, already served in the Teurastamo restaurants Kellohalli and B-Smokery. In Holohan's words, it's a smooth, honest gin with lingonberry notes that is equally suitable for sipping as well as gin and tonics. It will hit Alkos in early 2015, as HDCO wants to be absolutely certain of its excellence, but also due to the fairly large production amount that Alko requires. The end result will retail at some 43 euros for half a liter, making it a bit pricier than, say, the Scottish Hendrick's. As I raise a bit of skepticism about the popularity of gin in Finland, Holohan is quick to counter by saying that Finns do enjoy lonkero and GTs. Still, he admits that the company has a way to go to bring the variety of gin to the audience, a variety that he compares to that found and recognized in whiskeys. One way to get on to the bandwagon are the HDCO gin tastings commencing in 2015, arranged in collaboration with the neighboring Flavour Studio. While gin and applejack, a Calvados-like drink made of apples (the excellent Finnish varieties, of course), have been in the company catalog already due to their less extensive maturation periods, the first ten year plan for HDCO naturally includes whiskey. The first batch of a 3-year rye is already in the making with single malt and more to follow in coming years. Sergei, Jari, and Hamidi, the HDCO fermentation tanks, work malts, Carl the copper pot distills, and a legion of French oak barrels nurse the unmatured distillate to become what Holohan sees as a range of whiskey that is not Irish or Scottish, but distinctly Finnish in nature. 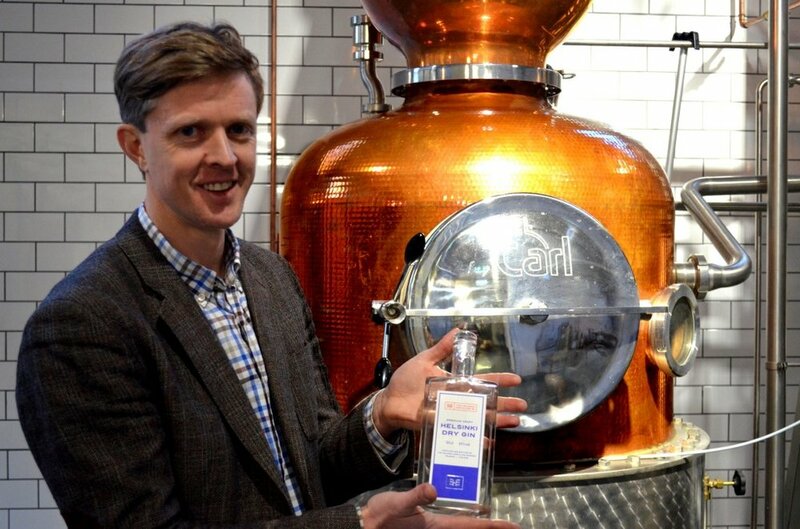 Co-founder Kai Kilpinen has on numerous occasions said that a distillery is as central to a civilized city as are theaters and libraries, an idea which the Helsinki Distilling Company aspires to introduce to Finland by showing, hands-on, the processes behind those clear and brown bottles on Alko shelves. Their emphasis is strictly on the experience that different liquors offer rather than the effects Finns (stereotypically) consider most important. On the Teurastamo website, Kilpinen says that they see a middle ground between binge drinking and high-class snobbery, believing that the Helsinki Distilling Company can cover exactly that ground. While the team doesn't look for for a ton of profit, they are still about to bring something new to the Finnish liquor table.